In 1922, Kalmus and his team were ready to unveil a major improvement in their process. In fact it was so improved that it had little relationship with their first offering. The camera and its prismatic optical system was totally redesigned for starters. The camera used in the subtractive two-color systems two and three. 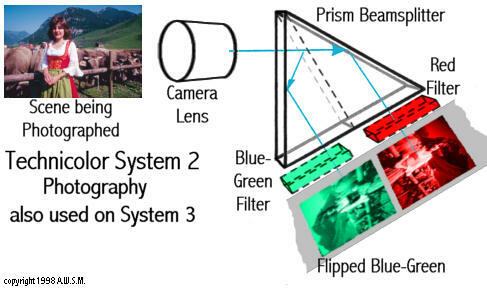 The camera speed was nominally 32 frames per second, 16 pairs of red and blue-green records. Prism illustration based on a sketch in Technicolor Movies by Richard W. Haines. 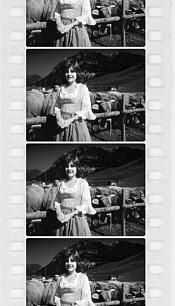 While the operation of the camera and its resulting film negative were significantly different than the first system, it was the fact that Technicolor adopted the subtractive color process that made the real difference. Additive systems used a black and white image projected through color filters, resulting in loss of the light absorbed by the filters. With the exception of lenticular additive systems, which have horrendous problems of their own, it is difficult to achieve and maintain proper registration of the color records on the screen. Subtractive systems, however, carry the color information in the image itself, with no need for inefficient filters and the registration is as good as the maker can put it on the film in the first place. Subtractive projection also has the ability to reproduce colors a bit more accurately. The camera negative carries both the red and blue-green records of the original scene. The blue-green record is upside down in relationship with the red record. Two separate prints are made on half thickness matrix films. The red matrix and blue-green matrix are also printed as mirror images because they will be placed back to back after application of the color dyes. 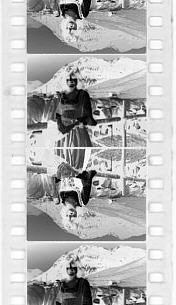 The matrix films were very much like a conventional black and white film, containing the usual silver halides that are light sensitive and also a special gelatin layer. 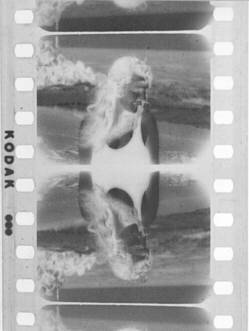 When the film is developed and the silver is removed, the gelatin remains as a "contour map" of the image. In System 2, the matrices were developed and then floated on a dye bath of a color complimentary to the original color record. While these illustrations were made specifically for this presentation, it is easy to understand why bright blue skies were avoided in all two color systems. As mentioned earlier, the two matrix films were half the normal thickness. Following application of the color dyes, the prints were then cemented back to back to form the final release print. The system solved registration problems, vastly improved overall image sharpness, had improved color reproduction and was the first "natural color" process that allowed standard projectors to run the film. It appeared to be very workable. 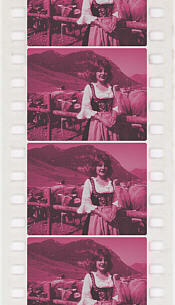 The first feature film made in Technicolor System 2 was produced by Joseph Schenk, who would be instrumental in the development of TODD-AO over thirty years later. 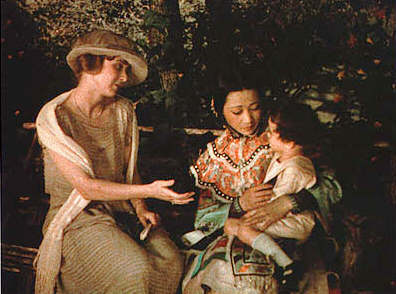 The film was called Toll of the Sea derived from Madame Butterfly but shifted to China. A frame from TOLL OF THE SEA (1922) Starring Anna May Wong. 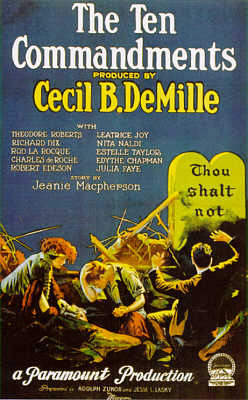 The film, Technicolor's first shot in Hollywood and released thru Metro, premiered in New York City in November, 1922 and went into general release in 1923. 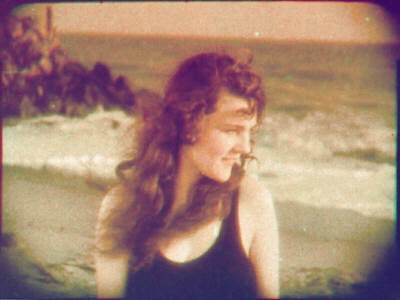 It was a success and was Technicolor's first profitable venture since the company was founded in 1915. 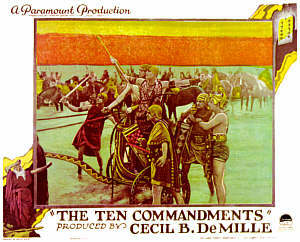 Cecil B. DeMille allowed Technicolor to shoot some sequences for his 1923 version of The Ten Commandments and a few were included in the film. The only sequences used were in the Exodus segment. Ray Rennahan and his Technicolor team shooting alongside DeMille's Paramount crew on the Exodus location. The cameras were tiny compared to the VistaVision units, with their 2,000 foot loads, used on the 1956 remake. Actually, the 1956 film had little in common with the 1923 version other than its title. Over half of the original took place in modern times. 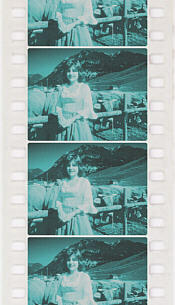 The image at left is a duplicate Technicolor System 2 negative, bearing a Kodak date code for 1928, from a Technicolor display showing the earlier system. The image at right is our composite version. The composite is an approximation of the original colors. Technicolor had a lot of latitude in their system. They could alter the tone and density of the dyes used to make the prints, along with adjusting the contrast and brightness of each record. We assume we've come fairly close to showing the original image. Negative photo courtesy of John N. Whittle.